Today's necktie is somewhat special. I have never worn it before even though I've had it for years. It's a Robert Talbott Sevenfold. I acquired it on Ebay for a lot less than what it was originally priced but I still somehow had that feeling of dread should harm come to it. Silly. It's a fairly different tie than what I normally wear but still very much in the realm of repetitive geometric. It's more horizontal than I normally care for. The pattern is made up of varying shades of blue and gold. 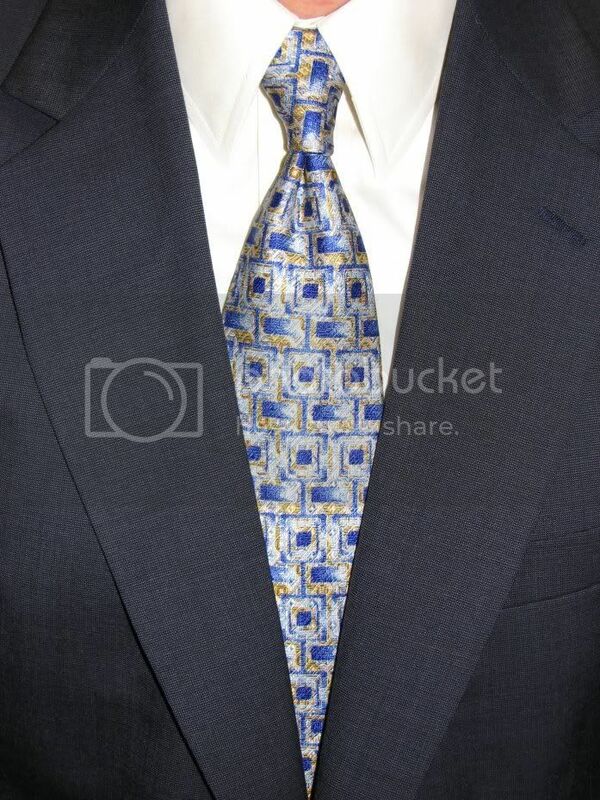 In person it really is a very nice tie and nearly ties itself into a pretty nice knot. I draped it over a background of an off-white (ecru) pinpoint, spread collar dress shirt. I was trying to pull out the gold a little more because the suit is a cross-hatched navy/blue pattern. I figured there was enough blue already between the suit and tie but I could have easily paired it with a blue or white shirt. Speaking of the suit, it is another Jos A Bank but it's an Executive collection rather than Signature. It's not quite as constructed (conglomerated?) as the Signatures but the pattern/texture was too cool to pass up.